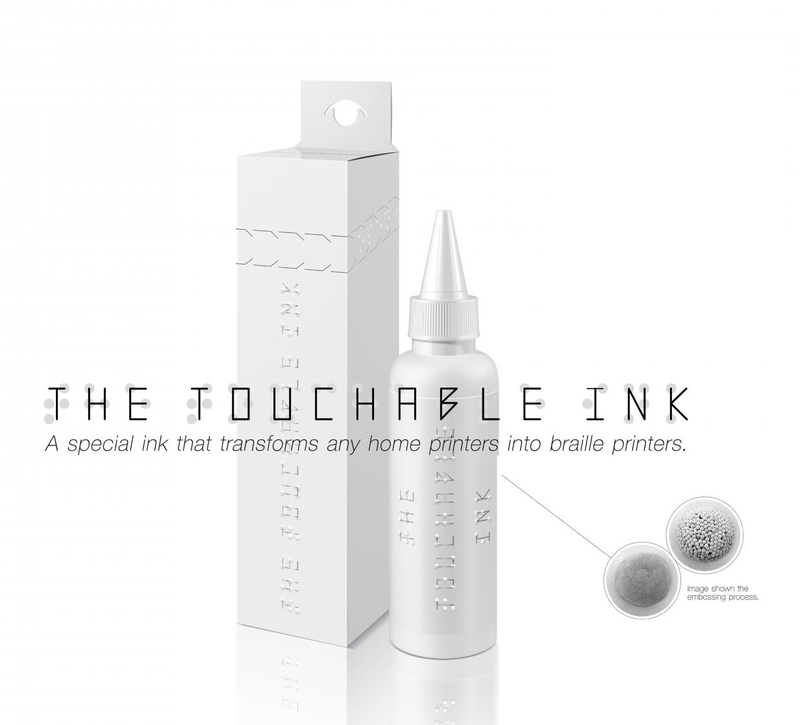 Samsung and Thailand Association of the Blind have worked with a chemistry professor at Thammasat University to develop Touchable Ink, a project in which laser printers are able to print braille-embossed documents. The Touchable Ink, still in its early days, involves a chemical process to adding embossing powder to the laser printing ink. Users just replace their ink cartridge with the Touchable Ink cartridge, change the selected document to braille font type, print out and heat it with normal household heating devices like microwave or hair dryer. This special ink will dilate and give an embossed effect, just like it’s printed out from the braille embosser. The project, promoted as part of Samsung’s approach to accelerating discoveries and possibilities, has won Grand Prix awards for Design, Healthcare and Innovation at Spikes Asia 2016. The first test on printed papers with touchable ink have been done with the selected visually impaired samplings from Thailand Association of Blind. More than 90% of them said it’s readable and no different from braille embosser’s one. With this innovation, they said it will help improve their quality of living since they can be independent and live on their own freely, no need to wait for help from others. The Samsung Touchable Ink project was developed at J Walter Thompson Bangkok by chief creative officer Satit Jantawiwat, managing director Parattajariya Jalayanateja, creative director Supachai Toemtechatpong, associate creative director Nopharit Dusadeedumkoeng, art director Charnpanu Suchaxaya, SEA digital director Hansa Wongsiripitack, brand team leader Pakrudee Yongsuvimol, group account director Bhasit Pattanapan, project manager Ponpat Rachatamutha, communication planner Prin Thanapisitikul, graphic designer Picket Rujivararat, digital technology manager Ronnatouch Pomee, agency producer Jiraporn Channawach, CCO secretary Panrutai Amattayakul, PR head Nattianan Vanichchannant, PR executive Pinjavee Rienmora, with global chief creative officer Matt Eastwood and APAC Creative Council chairman Lo Sheung Yan. Filming was shot by director Pen-Ek Ratanaruang via The Film Factory, Bangkok, with executive producer Rewat Vorarat, producer Phuangphaka Rutimanon, editor Nitty Tanprasitwat, director of photography Chant Chamnivikaipong, colourist Arthur Lam. Sound and music were produced at Wild At Heart by sound designer Chattawat Eaumkeb, audio engineer Kanin Upanun, music producer Amornbhong Methakunvudh, music arranger Patthamon Pongchaiprasert.